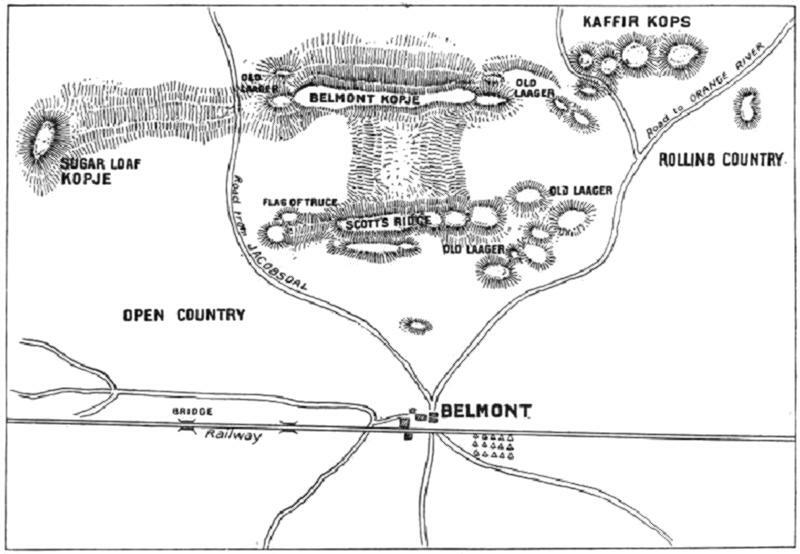 Belmont, a railway station in Cape Colony close to the western border of the Orange Free State, was the scene of an action fought on 23 November 1899 (in the opening stages of the Second South African or Boer War) between British troops under Lieut.-General Lord Methuen and a Boer force attempting to frustrate efforts to relieve the besieged diamond-producing town of Kimberley, 90 kilometres to the north. When Methuen marched out from the Orange River on 21 November, he had about 8,500 men and sixteen guns. Mounted patrols informed him that some 2,000 Boers were entrenched 30 kilometres ahead, atop a range of kopjes (small hills) dominating Belmont station from the east. In response to this information, the next day Methuen marched his infantry to a farm situated about three kilometres to the south of the station and west of' the railway line. From here, he began reconnoitring the enemy position in preparation for an attack to sweep aside this blocking force. Among the mounted troops engaged in this effort was a small group of 29 members of the New South Wales Lancer Regiment under Lieut. S.F. Osborne, part of an advance element of 72 men on this unit which had arrived at Cape Town on 2 November. The remainder of the New South Wales contingent had been sent to sense with forces in the Colesberg area under Major-General john Drench, but Osborne's troop had been attached to tile 9th Lancers - which comprised the main element of, Methuen's limited force of cavalry - and while carrying out patrols became tile first Australian troop to come under fire during the Boer War. 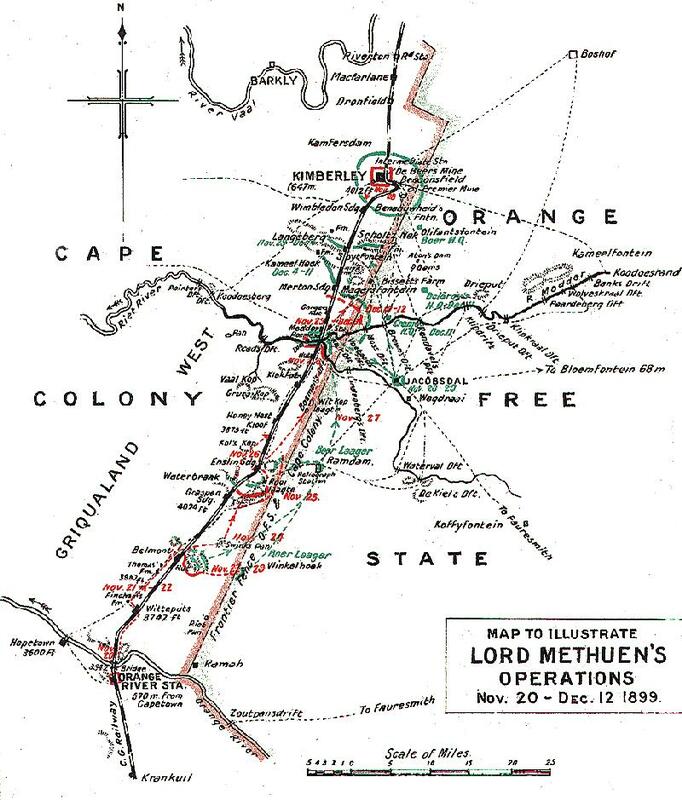 Based on the information available to him Methuen decided to attack on 23 November and began moving his troops across the Great Karoo plain towards the enemy positions at 2 a.m., in preparation for an assault at first light. 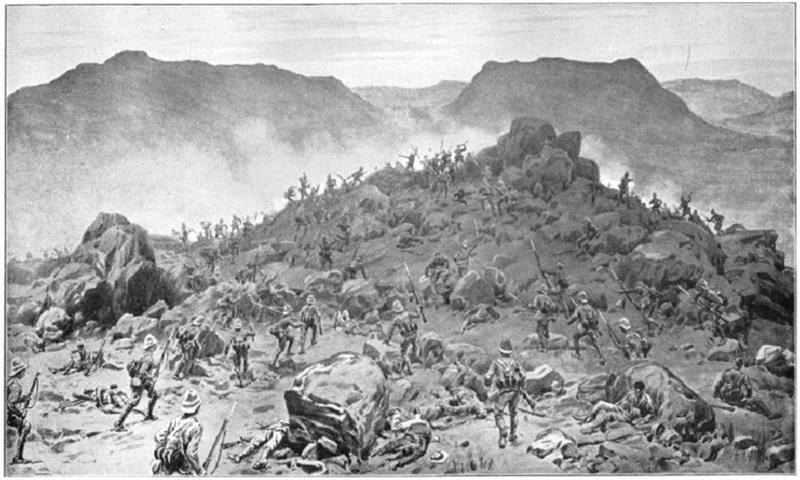 The ground held by the Boers was inherently strong for defence, comprising a succession of rocky ridges rising from 30 to 75 metres above the level of the surrounding plain. About 2,000 Boers were waiting in well-placed stone breastworks on each crest, supported by five guns. At about 4 a.m. the advancing British troops came under heavy fire and the fighting soon extended across an area of thirteen square kilometres. The engagement ended with the Boers breaking off at about 7.30 a.m. and making an orderly retreat across the open veldt. About 70 were left behind as prisoners, 24 of whom were wounded; other Boer casualties were unknown, but reckoned at about 100 killed. Methuen was unable to disrupt the enemy withdrawal, both because the 900 cavalry and mounted infantry which he had was insufficient to mount a pursuit and also because the horses of his mounted units were too exhausted from their work prior to the battle. For this victory, his force had suffered 295 casualties (75 of whom were killed) the worst loss occurring among the Grenadier Guards, which lost 22 killed and 114 wounded; among the dead was Private Henry Schultze, a native of St Arnaud, Victoria, who had enlisted in this regular British regiment. THE BATTLE OF BELMONT, 23rd November 1899—BAYONET ATTACK BY THE SCOTS AND GRENADIER GUARDS. Extracted from the book produced by Chris Coulthard-Clark, Where Australians Fought - The Encyclopaedia of Australia's Battles, Allen and Unwin, Sydney, 1998, pp. 57-58. B.T. Batsford; and, R. L. Wallace (1976) The Australians at the Boer War. Canberra: Australian War Memorial & Australian Government Publishing Service. LIEUTENANT GENERAL LORD METHUEN, C.B. On the morning of Tuesday, the 21st of November, at three o'clock, Lord Methuen's march to the relief of Kimberley definitely began. The force consisted of the Naval Brigade, the 9th Brigade under Colonel Featherstonhaugh, the Guards Brigade under General Sir H. Colvile, two batteries of Field Artillery, Rimington's Guides, and the 9th Lancers. The first halt was made at Fincham's Farm, some twelve miles off, where the troops breakfasted, and whence the 9th Lancers and Rimington's Guides started on a reconnoitring expedition, which was not without its excitement. The Boers were reported to be somewhere in the vicinity, and soon they were espied, some three hundred of them, climbing a kopje with the evident intention of firing down on the party. This they did, and with such rapidity that only by sheer luck the men escaped. They went on to the farm of one Thomas, a supposed loyalist, for the purpose of watering their horses. This person had declared that there were no Boers in the neighbourhood; but no sooner had the tired beasts begun to dip their dusty noses in the cool and longed-for draught than a brisk fire was opened on them from all sides, and the troops had hurriedly to return to the main body at Fincham's. But they lost three horses. On the following day the division moved on to the said Thomas's Farm. The advance party again came under fire—"Just by way of salute," as Tommy said—but the enemy was promptly silenced. Here the troops bivouacked. On the night of the 22nd coffee was served out about twelve o'clock, and after this the whole force prepared to move. The general orders were as follows: "At three a.m. Guards Brigade to advance from small white house near railway on Gun Kopje, supported by battery on right plus Naval Brigade; 9th Brigade on west side of Table Mountain; at same hour, bearing already taken, supported by battery on left, 9th Lancers, two [Pg 87] squadrons, one company Mounted Infantry, marching north of Belmont Station, keeping one to two miles on left flank and advanced; Rimington's Guides, one squadron Lancers, one company Mounted Infantry from Witte Putt to east of Sugar Loaf; one company Mounted Infantry on right of Naval Brigade, protecting right; the force having got over open ground should arrive at daybreak on enemy; 9th Brigade having secured Table Mountain to swing round left and keep on high ground, and then advance east to west on A (on plan; not printed); Guards Brigade conform, being pivot; then Guards advance on east edge of Mount Blanc, guns clearing entire advance with shrapnel; cavalry to get round rear of enemy, securing horses and laager." This carefully-arranged programme, however, was not followed in its entirety. In the grim blackness of the small hours the Grenadiers lost direction, and Lord Methuen was committed to a frontal attack. But still the attack was a brilliant success. The Boers were caught napping, for they were in the happy belief that the troops were still at Witte Putt at the very hour when they were marching steadily upon them. The infantry tramped four miles in pitch darkness and took up their position on a long low hill facing the enemy. The Boers occupied a magnificent horseshoe-shaped position on a series of kopjes and ridges eastward of Belmont railway station. As usual, they had utilised the boulders as screens, behind which they could [Pg 88] safely blaze away at the advancing ranks. Near daybreak—the hot summer morning dawned about four o'clock—firing began. The Guards had opened out for the attack, and the Boers, suddenly espying them from the heights, thereupon commenced to pelt and batter them. The Scots and Grenadiers nevertheless proceeded. Their position was far from comfortable, as it was necessary to cross some hundred yards of arid open veldt with no cover at all, while the enemy, ensconced behind tremendous rocks some 500 feet above their level, had nothing to do but to point their rifles and send their bullets whizzing at the advancing mass. But the Guards stoutly held their own, lying down and returning volley after volley for a full half-hour. Meanwhile the 9th Brigade advanced across the plain in extended order, and at half-past four two batteries posted near the railway commenced shelling the enemy's position. Now the Guards began to proceed. Steadily forward they went—the thin, extended line moved as on parade, no supports being behind them. Scarcely had they reached the base of the hill than a fierce storm of lead poured like a cascade from guns and rifles. It was useless now to attempt to return the fire—the Boers were invisible. There was no help for it; the men had only to move on and trust to their best "cold Sheffield" and their warm, gallant hearts. They fixed bayonets. Major Kinloch gave the word to his men to advance. "Now, boys, as hard as you can go!" he sang out. The other officers shouted their orders; all were dashing along like lions loosened from a cage. Cheers rent the air, bullets buzzed, cannons roared, blood streamed and spouted, plucky men and brave boys dropped dead on every side. Yet on went the infantry brigades! The first kopje was stormed! The Boers had vanished! It was a sight to thrill the blood, to make the heart leap to the throat—so grand, so awful, so reminiscent of all the great traditions of British history. The enemy went helter-skelter to their second kopje on the right, where another force was strongly intrenched. Here they were sheltered by a number of "schantz," or trenches built of boulders and arranged in gallery form, and here our men mounted after them—Coldstreams, Grenadiers, Scots Guards, Northumberlands, Northamptons, and 2nd King's Own Yorkshires, now steadily advancing without excitement and with stern determination, and through a horrible cross-fire from the death-dealing rifles of the enemy. Their advance was grand—a feat of heroism—with the Boer missiles flying about their heads and the track of blood seeming to tinge the very atmosphere with red. On and on they pushed, cheering loudly up the steep incline and over the boulders, nimble as goats, determined as giants, on and on, and, with a mighty roar, [Pg 89] took the position. Dead men lay at their feet, but honour, with its laurel crown, wreathed their heads! Again the Boers made a hasty, a desperate retreat; again they sought a strongly-fortified position; again, our cavalry being too far off to reach them, the infantry combat was renewed. A hurricane of bullets poured down. Death for the third time stared and gibbered; for the third time our gallant fellows, all in mass, again advanced to the attack. The Naval Brigade brought up four guns, and Captain Prothero got his cannon in position of 1800 yards and blazed out a chorus of distraction. The enemy fled. The rout was now complete. Away went the 9th Lancers, away went the Mounted Infantry, both pursuing the fugitives for a good five miles. Thus the battle of Belmont was won. The whole of the camp waggons, filled with boxes of clothing, hundreds of horses and bullocks, were captured, and tons of ammunition were destroyed. But this fight, that has taken so short a time to describe, and which was over in less than four hours, was hardly won. Forms all bloodily dashed lay here and there and everywhere, and the Scots Guards, who had stormed the kopje to inspiriting strains of drums and pipes, were doomed later on to hear the wail of the pibroch for many comrades mourned and buried. In all, our losses—about 200—were comparatively small considering that the engagement was a series of three battles, during which the Boers were constantly carrying off dead and wounded. Very many of our officers were wounded and three were killed. One—Lieutenant Fryer of the Grenadier Guards—was slain while gallantly leading his men and creeping along the bed of a stream in the enemy's rear. After the battle Lord Methuen made the following address to the troops: "Comrades, I congratulate you on the complete success achieved by you this morning. The ground over which we had to fight presented exceptional difficulties, and we had as an enemy a past-master in the tactics of mounted infantry. With troops such as you are, a commander can have no fear of the result. There is a sad side, and you and I are thinking as much of those who have died for the honour of their country and of those who are suffering as we are thinking of our victory." Three instances were reported of the despicable treachery of the Boers. Lieutenant Willoughby was shot at from an ambush under cover of the white flag; a Boer holding a white flag in his left hand murdered Lieutenant Brine with his right, and Lieutenant Blundell-Hollinshead-Blundell (3rd Batt. Grenadier Guards) was shot in the merciful act of tending a wounded Boer. Lord Methuen after the fight sent a remonstrance to the Boer commander, saying, "Acting quite fairly with you, I decline to take Kimberley men [Pg 90] who know the country, because their parole cannot be accepted. I must ask you to warn your wounded not to shoot our officers. I must warn you not to use Dum-Dum bullets, or use the flag of truce treacherously. Such action is cowardly in the extreme, and I cannot countenance it." Plan of the Battle of Belmont. The Boer losses were reported as very small, but no credence can be placed on their statements, for the very good reason that it has been President Kruger's policy to conceal from outsiders, and even from his own country, the extent of his losses. Whenever the Boer dies in battle, his body is weighted and cast into a river, or into a trench as quickly as possible. His family are left in ignorance as to his fate, and their only conclusion is to assume that he is dead. But Mr. Kruger's methods and his ruthless military oligarchy were disapproved even by his own countrymen, and more especially by his own countrywomen, who now began to mistrust the continual story of Boer victory, and asked pitifully for permission themselves to seek for fathers, sons, and brothers from whom they never heard. In some cases many of these were lying not an inch below their feet, for a British search party came upon a portion of the veldt that was literally mosaicked with dead Dutchmen whose bodies were scarcely more than peppered with earth! Mr. Knight, the correspondent of the Morning Post, who was a [Pg 91] general favourite, was wounded in a singularly treacherous manner. He was in the firing line of the Northamptons, who were then attacking the Boers. Some of the enemy suddenly emerged from behind rocks and displayed a handkerchief attached to a rifle. On this sign Mr. Knight with two others rose, and all three were instantly shot with Dum-Dum bullets. Mr. Knight's sufferings were great, and the arm was amputated. The use of Dum-Dum bullets had been proscribed, as, after hitting the mark, they expand and cause wounds as large as a five-shilling piece. The Boers, besides using them on occasion, so manœuvred the Mauser bullets that they could act in identical fashion. Another treacherous Boer device was the wearing of the red cross upon their sleeves—an action on a par with the display of the white flag—for convenience' sake. However, it must always be remembered that the Boer armies were commandeered and cosmopolitan armies, and not disciplined troops. During the heat of the fray Colonel Crabbe, commanding the Grenadier Guards, became detached from his regiment. He was instantly surrounded by Boers, and being wounded, might probably have been killed had not a private suddenly rushed to the rescue. The plucky fellow shot two of the enemy, silenced a third with his bayonet, and finally, amid a shower of bullets, carried off the Colonel to the shelter of an ambulance waggon. Colonel Crabbe sustained injuries to wrist and thigh, but was not dangerously wounded. A curious experience befell the Hon. George Peel, who was trying to reach Kimberley, where his sister, the Hon. Mrs. Rochfort Maguire, was imprisoned. Roaming about after the battle of Belmont, he came by accident on a Boer camp. A Dutchman promptly emerged, and when he was preparing to meet a grim fate, deciding that all hope was lost, he found himself accosted and handed a Bible. He was in the very act of congratulating himself on his lucky escape when on the scene came two grenadiers, who seeing his battered condition and his Bible, mistook him for a Boer spy and carried him off as a prize. Fortunately he was recognised by a member of Lord Methuen's camp and liberated. Captain, Brigade Major, 9th Brigade." 3rd Grenadier Guards.—Lieutenant Fryer, killed; Lieutenant Blundell-Hollinshead-Blundell, dangerously wounded; Second Lieutenants Leslie and Vaughan, wounded; Lieutenants Gurdon Rebow and Russell, slightly wounded; and in addition the following officers reported as wounded: Lieutenants Lygon and Cameron, and Lieutenant-Colonel Crabbe. 1st Battalion Coldstream Guards.—Lieutenant Grant, wounded. 2nd Battalion Coldstream Guards.—Lieutenant the Hon. Claude Willoughby, slightly wounded; Second Lieutenant Burton, severely wounded. 1st Battalion Scots Guards.—Major the Hon. North Dalrymple Hamilton, severely wounded; Second Lieutenants Bulkley and Alexander, wounded. 1st Battalion Northumberland Fusiliers.—Captain Eagar and Lieutenant Brine, killed; Major Dashwood and Lieutenant Festing, dangerously wounded; Captain Sapte and Lieutenant Fishbourne, Brigadier-General Featherstonhaugh, Captain Freeland, 2nd Northampton, Lieutenant Barton, 2nd Northampton, severely wounded. The battle of Belmont saw the first fighting during Lord Methuen’s failed attempt to raise the siege of Kimberley. He had left his base on the Orange River on 21 November, with a force of around 8,000 men. His plan was to follow the railway straight to Kimberley. This predictability would allow the Boers to take advantage of the few natural obstructions on the route. The first of those obstructions was at Belmont, twenty miles from the Orange River. There the railway ran past a cluster of low hills east of the track. Near to the railway were two peaks (given the names Gun Hill for the southern and Table Mountain for the northern peak by the British soldiers). Behind them to the east, separated by a narrow pass or nek was a taller hill, given the name Mont Blanc. The main Boer force at Belmont was composed of around 2,000 men from the Free State under Jacobus Prinsloo (Kroonstad, Fauresmith, Bloemfontein, Brandfort and Jacobsdaler commandos). Another 800 men from the Transvaal, under De la Rey, arrived in time to cover the Boer retreat at the end of the battle. Methuen based his plan of attack on a faulty understanding of the nature of the hills. He was unaware of the gap between Table Mountain and Mont Blanc. Instead he believed there to be more high ground between the two hills. His plan was for the 9th Brigade to attack Table Mountain and the Guard’s Brigade to attack Gun Hill. The Coldstream Guards would then seize the non-existent high ground, while the 9th Brigade would use it to attack the northern flank of the Boer positions on Mont Blanc. They would do this after a night march that would place them at the base of the hills under cover of darkness. The plan went wrong almost from the start. At first light on 23 November it was realised that the march had stopped 1,000 yards short of the base of the hills, probably because the British were not yet experienced in judging distances in the clear air of the veldt. This meant that the assault would have to be made in daylight, and after a dash across open ground. Despite this, the British soldiers proved that they could make successful attacks up hill against the Boer’s rifle fire. The attack began soon after 3.30 a.m, and by 4.20 the British had reached the top of both Table Mountain and Gun Hill, although not without losses. It would take longer to clear the top of Table Mountain, but the big problem now was posed by Mont Blanc. The 9th Brigade, whose role it had been to attack this second position, now found itself in the wrong place to do so. The western face of Mont Blanc, facing Table Mountain, was the steepest, and well defended by the Boers, who had had time to prepare their positions. Fortunately for Methuen, the Coldstream Guards solved his problem. Their original role had been to capture the non-existent high ground north east of Gun Hill. When it became clear that there was no such ground, they drifted right, eventually capturing the southern end of Mont Blanc (with help from the Northamptons and the Grenadiers). With three of the four areas of high ground lost, the Boers decided to withdraw. At around 7.30 a.m. they abandoned their positions on Mont Blanc, returned to their horses, and escaped north. This was when Methuen’s lack of cavalry became significant. He simply could not mount a pursuit of the Boers. An attempt was made to do so by Rimington’s Guides and a squadron of the 9th Lancers, but they were outnumbered by fresh Boer horsemen under De la Rey and were lucky to escape intact. British losses were 74 dead and 220 wound. Boer losses were officially reported at 12 dead and 40 wounded, but the British buried 30 Boers found after the battle. Forty prisoners were taken, and Boer losses may have been around 100. Prinsloo was badly shaken by the fighting at Belmont, especially by the determination of the British advance. The high kopjes may have looked like ideal defensive positions, but the steep slopes actually gave the advancing troops some protect. In many battle of the war, the most severe fighting would happen on the flat tops of the hills, not on the steep slopes. Methuen meanwhile was confirmed in his belief in the frontal assault. 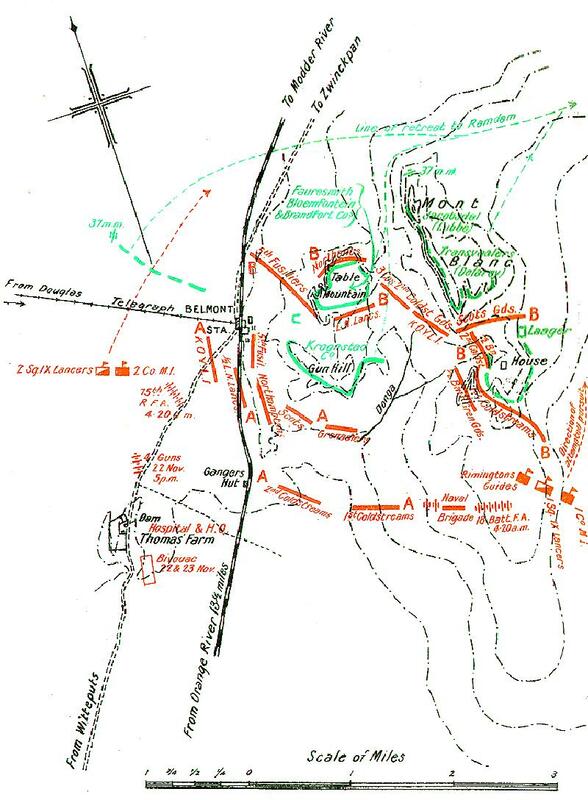 He would repeat the same tactic at Rooilaagte, the Modder River and Magersfontein, with decreasing success. Belmont is normally described as a “soldier’s battle” as it was won by the determination of the infantry, and not through any great skill on Methuen’s part. Rickard, J (12 February 2007), Battle of Belmont, 23 November 1899. Times, 24 November 1899, p. 5. (Begins.) Belmont, Nov. 23. - Attacked enemy daybreak this morning in strong position. Three ridges carried in succession, last attack being prepared by shrapnel. Infantry behaved splendidly and received support from naval brigade and artillery. Enemy fought with courage and drill. Had I attacked later I should have had far heavier losses. Victory was complete. Have taken 40 prisoners, and am burying good number of Boers, but the greater part of the killed and wounded have teen taken away by their comrades. Have large number of horses and cows ; have destroyed large amount of ammunition. Dangerously wounded. - Lieutenant Blundell. Wounded. - Second Lieutenants Leslie and Vaughan. Slightly wounded. - Lieutenants Gurdon-Rebow end Russell. And in addition the following officers are reported as wounded.-Lieutenants Lygon, Cameron, and Lieutenant-Colonel Crabbe. Rank and file. - Killed 26, wounded 36, missing 13. Rank and file.-Killed 8, wounded 17, missing 5. Slightly wounded. - Lieutenant the Hon. Claude Willoughby. Severely wounded. - Second Lieutenant Burton. Rank and file. - Wounded 6. Severely wounded. - Major the Hon. North Dalrymple Hamilton. Wounded. - Second Lieutenants Bulkely and Alexander. Rank and file. - Killed 9, wounded 34. Officers killed. - Captain Egar, Lieutenant Brine. Dangerously wounded. - Major Dashwood, Lieutenant Felting. Severely wounded. - Captain Sapte, Lieutenant Fishbourne. Rank and file. - Killed 12, wounded 32. 2nd BATTALION SOUTH YORKSHIRE REGIMENT. Rank and file. - Wounded 3. Officers severely wounded. - Captain Freeland, Second Lieutenant Barton. 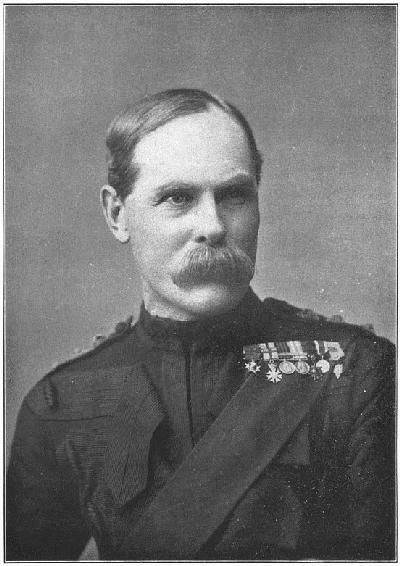 A later telegram reports Brigadier-General Fetherstonehaugh severely wounded through shoulder. Gatacre reports having yesterday encamped a battalion of infantry at Putters Kraal, and that reinforcements of mounted troops and half a battalion of infantry will be moved to same camp to-day. Dutch rising continues in Broken Nail districts. Police at Molteno report armed Dutch left Cradock to join rebels at Broken Nail, taking armed natives with them. French conducted reconnaissance towards Arundel, which he found held in strength, and withdrew with three men wounded - No. 1,996, Policeman L. Bawtree, thigh, dangerous; 3,084, Corporal Thomas, chest and arms, dangerous; 4,618, Private Willett, arm, serious, both of mounted infantry 1st Worcester Regiment. Boers reported moving from Natal to vicinity of Bloemfontein. Telegraphic communication with Belmont reopened. Line inspector reports heavy engagement to the east of Belmont to-day. Enemy utterly routed. No details yet received. Postmaster Hope Town reports Kuruman people have defeated North rebels. ORANGE RIVER, Nov. 23, 1 p.m.
Mr. J. D. Logan, a member of the Cape Legislative Council, who has just returned here from Belmont, states that the British troops have engaged the enemy on this side of Belmont. The British artillery practice was magnificent, and the infantry carried the kopjes at the point of the bayonet, driving the Boers from their position. There are Boers all round Witteputs. They are constantly sighted. It is reported that they are retiring on Belmont. A reconnaissance with lancers was shelled yesterday morning by the Boers from Belmont Station at 600 yards. The shrapnel burst well, but we had no casualties. The enemy's force is estimated at 2,000 men with five guns.